What grows in the vineyards of Oregon? Grapes, naturally. But like those whose labor is essential to the success of the vines and who have been largely unnoticed, there are less obvious yields of fundamental importance to the industry and the community. 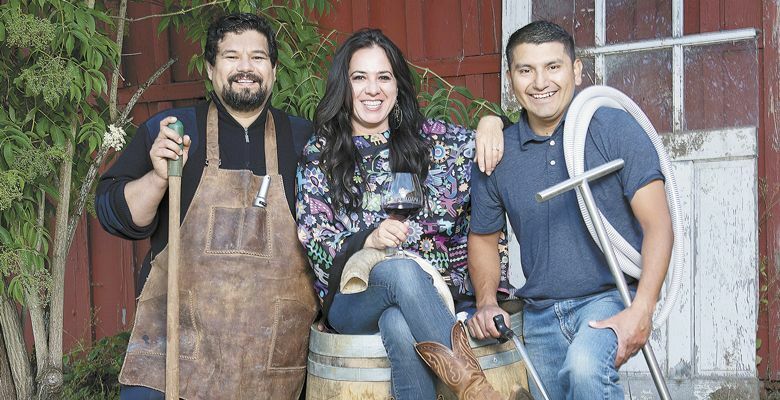 The following three members of the Oregon wine industry — two of whom are native Mexicans; one, a first-generation American of Mexican descent — are eager to draw attention to the vineyard workers, the majority of whom are Hispanic desiring a chance to advance. Jesús Guillén, Sofía Torres McKay and Miguel Lopez are forming an organization to increase appreciation of these skilled laborers, helping them overcome challenges to realize their ambitions. As part of this effort, each offered an inspirational personal story and vision for the future. 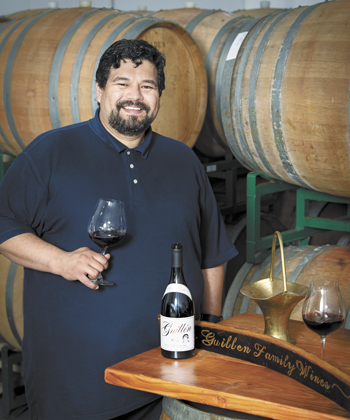 Since becoming one of the first Mexican-born head winemakers in Oregon in 2008, Jesús Guillén has received plenty of press coverage from publications like The Oregonian, Portland Monthly and others. Now, he’s interested in sharing the limelight with those not as celebrated while serving as an example of what can be achieved when starting among the vines. Jesús also salutes Mark Vlossak, owner and winemaker of St. Innocent, who taught him the fundamentals of winemaking, as well as the late Gary Andrus, who educated him on the basics of whole-cluster fermentation: “A technique I have honed to my liking,” Jesús says. Reflecting his intense connection to his family, he credits his grandfather and father for his understanding of agriculture and his wife, Yuliana, for her support as he strives to establish his own brand: Guillén Family Wines. In 2007, Jesús’ released his first wine under the Dreamcatcher label. Not yet owning his own vineyard, he acquires grapes from a number of sources, including Vista Hills, Meredith Mitchell and Domingo, a vineyard owned by Sanders and named for Jesús’ grandfather. He is now producing about 1,000 cases a year under the Guillén Family label. Beginning this year, he’ll be crafting his wine at the Dundee Hills Wine Library in Newberg, where tastings are conducted by appointment. When Eugene native Ryan McKay met Sofía Torres in San Francisco in 2001, he shared his passion for Oregon Pinot Noir. She fell in love with both. The Mexico City native and lover of big reds became curious about the region and the wine. So much so, the couple, married in 2005, eventually traveled to Oregon wine country, and searched for the perfect site to call their own. In 2011, they bought 10 acres on Worden Hill Road in the Dundee Hills, after selling a house in British Columbia — in a favorable market. In 2012, they began planting at an elevation of 500 to 600 feet. Five acres are planted to Pinot Noir, including the rare clone 122 from Vosne-Romanée, a Grand Cru vineyard in Burgundy; and one acre to Chardonnay. Inspired by the crimson clover covering the property in spring, the couple named the vineyard, Cramoisi, which translates to “crimson” in French. While Ryan continues working his day job and helps when possible, Sofía left her IT sales career in 2017 to devote all her efforts to the venture — and raising two sons. 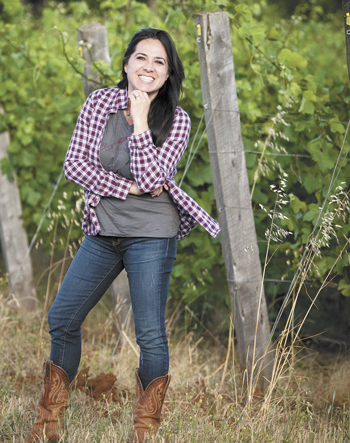 She is one of the few Hispanic vineyard owners in the Willamette Valley. Since the business is very small, she performs numerous roles, including vineyard management, marketing and sales, event planning, relationship building and management, and administration. Jessica Cortell, owner of Vitis Terra Vineyard Services, and her crew tend the vineyard, with help from Sofia; she says “the energy of the place” is important to her, taking pains to ensure the vineyard’s atmosphere is positive. Sofia communicates with the workers in Spanish and has developed an easy, informal relationship — as well as an empathy — with them. The workers call her Sofía or “la chilanga,” referring to her Mexico City origins. They joke around. She encourages them to think about their careers and what they’d like to do. “That’s something I want to teach and motivate the people in the vineyard — not that you have to be an owner but you can perform on the job.” Though they are not her employees, her bond with them remains strong. “I’m part of them, and they’re part of me,” she proudly notes. Cramoisi Vineyard is farmed Biodynamically, though not yet certified. In 2014, it produced enough to make one barrel (25 cases) of wine. The following year, 2015, the first formal vintage, also yielded 25 cases. Production increased to 300 cases in 2016 and 600 in 2017. Drew Voit makes the wine with eager disciple Sofia looking over his shoulder. Taste Cramoisi Vineyard by appointment at the vineyard. Plans call for a small vineyard tasting room. Miguel was born in 1984 — a year best forgotten by Oregon winemakers — to immigrants from Oaxaca, Mexico. His father had been the first vineyard manager at Beaux Frères. “He and Michael [Etzel] did all the labor in the early days together and, as a result, as a child, you get dragged along, so I got to see a lot of the Beaux Frères property, and also hang out and work with the family.” he recalls. While at McMinnville High School, Miguel helped his father, who had moved to another company, doing odd jobs during summers. Since vineyards were being planted all over the Valley, they were active in all the AVAs (American Viticultural Areas). During the school year, Miguel walked across the street to help at Walnut City WineWorks, which was getting started. After he graduated in 2003, he considered joining the Marines as situations worsened in the Middle East, but felt ambivalent. He approached Zac Spencer, former owner and winemaker at Walnut City, who responded positively when Miguel asked to help with harvest. 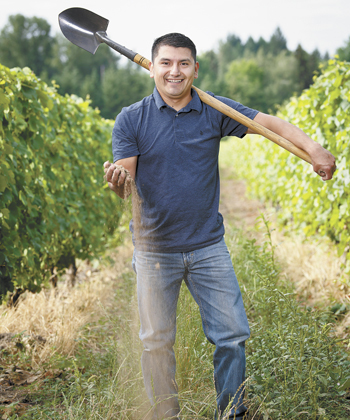 This led to his first full-time job in the industry along with financial assistance to attend the Chemeketa Eola Northwest Viticulture Center. Miguel obtained an associate’s degree in winemaking in 2010 and moved on to positions at Domaine Serene, Soter Vineyards and Ransom Wine & Spirits over the next two years. He worked in wine sales and marketing during a stint at Vertical Wine & Beer Distribution before joining Domaine Roy et Fils in 2013, at the inception of the Dundee Hills winery. Miguel acknowledges as mentors the two founders of Walnut City, John Davidson and John Gilpin, as well as Zac Spencer, who showed him “that it’s hard but also to have fun while doing it.” Other major influences include: John Zelko, owner and winemaker of Z’IVO Wines, who helped him through school; Tony Soter, owner and grower of Soter Vineyards; Jason Lett of The Eyrie Vineyards, and Tony Gaine and Earl Cramer-Brown of Vertical Wine. In 2017, Miguel and his sister, Eva Lopez, formed Red Dirt Vineyard Labor “that takes solid skill-set vineyard workers and pays them a wage that is above that of a run-of-the-mill farm labor contractor.” The starting pay of the workers is where other contractors top off. Wages of the teams are reevaluated regularly and adjusted accordingly. “It keeps the teams together and shows them that we care about their financial well-being,” he says. “We’re not a vineyard management company,” he insists; instead, Red Dirt operates with a different business model. The highly skilled team takes direction from a vineyard manager or consultant and follows his or her practices. The business keeps a low profile with no web presence, relying on word of mouth for attracting both engagements and team members. Starting Red Dirt resensitized Miguel to the challenges facing vineyard workers and motivated him to lead the formation of the group with Jesús Guillén and Sofia Torres McKay. With numerous issues to address and paths to consider, plans remain inchoate. “There are a lot of things up in the air right now. The way I see it going is baby steps,” he admits. He credits Sofia with “rounding them up when they slack off.” All three hope telling their stories marks the beginning of a continuing process of drawing media attention, not just to the most visible Hispanics in the industry, but to those who labor behind the scenes. 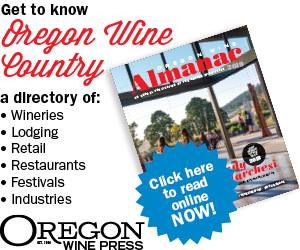 Beyond the raw material that becomes wine, Oregon vineyards represent fertile sites for strengthening family ties, gaining skills, building self-confidence, nurturing careers and advancing the dreams of those who work in them. Jesús, Sofia and Miguel envisage their new organization stimulating these other essential yields to bring long overdue changes to the perception of vineyard workers and create opportunities to realize their aspirations.